Happy Bloom Day, everyone! Wait...that was over a week ago, you say? Oh well..., at least it's still August, right? It's that special time of year, late summer, where I think a lot of people start to feel restless. We're sick of the unrelenting heat and ready for fall, but not quite ready to let go of summers lushness. I also officially want to call mulligans on the Fling...at least for my garden, which always looks better as we approach fall...but I suppose that isn't fair to everyone else, is it ;-) I'm always surprised by how many people in town say their gardens decline after July...it seems so odd...but I know people plan their gardens to "peak" at different times of the year. While the poor Agastache in the parking strips still haven't quite recovered from our winter floods, the other Agastache have been blooming happily for months. This 'Desert Sunrise' (or Desert Sunset) got unceremoniously transplanted this spring from a too-shady spot and has recovered nicely. I've come to the conclusion this summer that even though I really love the blooms and seedheads of Knautia macedonica, it's just so messy after flowering, that I'm going to replace them next spring with this plant, Scabiosa ochroleuca, which blooms forever on these wonderful, spindly stems and never flops open like Knautia always does for me. I cut the main flowering stems of all my Epilobium back a week or so ago, and they've rewarded me with masses of blooms on smaller side shoots...the bees are extremely grateful. It wouldn't be late summer without Rudbeckia...as the light moves lower and lower on the horizon, their color intesifies. If only Rudbeckia triloba were truly perennial, not just short-lived, I'd have it everywhere...it's so perfect. Luckily, I always have a few self-seeded plants...although not always in the most appropriate spots! Persicaria 'Golden Arrow' could be grown exclusively for it's glowing chartreuse foliage, happily, the blooms are just as good as the leaves! The similar 'Fire Tail' will never be grown for it's foliage, being rather coarse and almost (dare I say it) "weedy", but the glowing ruby wands of flowers redeem it in my book. They are especially charming if allowed to be infiltrated by other plants, as here, with Geranium 'Rozanne' and Sidalcea oregana, where they are simply brushstrokes of color. I'm a huge fan of Sanguisorbias...and the shorter, stockier variety 'Tanna' is one of the best...especially if you have a semi-shady garden like mine and the taller ones are prone to flopping. I may eventually replace the bigger Sanguisorbia mensiezii with this variety. Can you ever have too many volunteer seedlings? Not when they are Verbena bonariensis...they make everything better! Absolutely no plant in the garden is as big a bee magnet as the Joe Pye Weed (Eutrochium). As soon as they start blooming the glorious mauve flowers are smothered with bees...and all sorts of other pollinators. Not only that, but they are fabulous structural plants, big and bulky, yet still elegantly lithe in a breeze. The wonderful summer-blooming Allium, 'Summer Beauty' is still going strong...just love it! While they finished blooming a few weeks ago, the steely blue seed heads of Echinops bannaticus will remain until spring. I love how the blooms of Echinacea fade and change color over the months...from vibrant magenta-pink to this softer, more romantic peach (in the background), and later on, a dusky rose. Another plant whose seedheads are as showy as the blooms...Macleaya cordata. The Cirsium occidentale started blooming last week and are wonderful! At first, I was afraid they would be a rather horrid tomato-red color...but so far, that is happily not the case! Geranium 'Ann Folkard' has had a really stellar year this year. Some years it gets terribly ratty...but so far, it's still lush and full of blooms! Speaking of vibrantly-colored flowers, you can hardly ignore the enormous trusses of Ironweed (Vernonia missurica) in the back yard at the moment. These lectrically-colored blooms sway on the tops of 10-foot-tall stems...and they are always covered in pollinators. There are so many self-seeded Teucrium in the sidewalks right now...I know I'll have to pull some of them this winter, or no one will be able to use the sidewalk next spring. So, that's the run-down of most of what's blooming in my garden right now, for a wider look, let's keep going. Here's a wide view of the whole garden, from across the street. Here's the North Border looking west at sunset. The same border, form the other direction. Here's a view of the North Border from the street, looking diagonally across the garden. Here' the Front Border looking South. And the same from the North. Here's a photo of the backyard, much of which was changed and re-planted this spring...hopefully it will have filled in by next year. And, of course, here are some cats! This is the neighbor's cat, Mowgli, enjoying the birdless bird bath. Here's Mr. Bates (aka Punky Cat) following me around as I make my rounds in the garden a few days ago. And here's Boots, giving us a wave until next time! For more blooms from around the globe, visit Carol at May Dreams Garden! Isn't Rozanne wonderful, I never cease to be amazed at how magnificently she blooms. Your garden is looking great, I admire the Joe Pye weed but still don't have some, sigh. I did try to grow some from seed this year but it is still small. I'm disenchanted with Knautia too, it gets so tall then the seed heads are a mess, except the variegated one, Thunder and Lightning, which has stayed much lower. 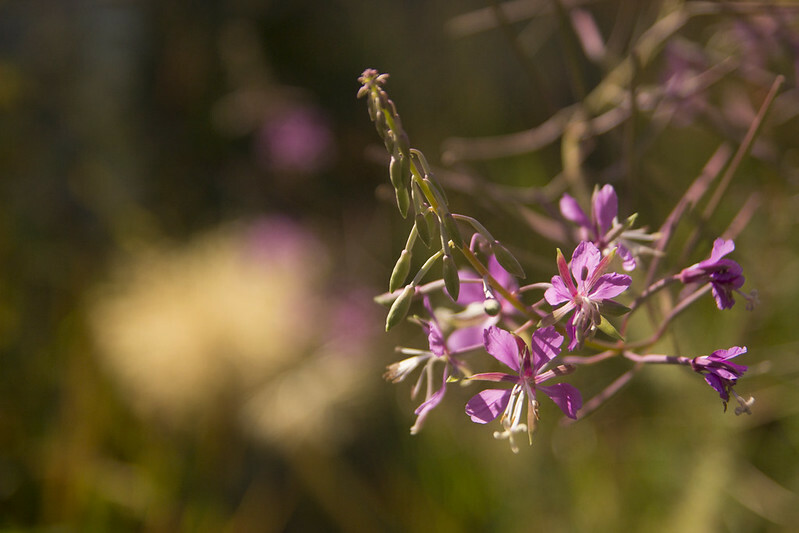 I love your photography with the focused flower and the background unfocused and dreamy. Your late summer garden is lush and colorful - the very opposite of mine. The lighting in your photos also fits the late summer mood and the cats are a bonus, of course. Boots does look as though he's waving (or perhaps saying "no photos while I'm bathing"). Just when I think I've got enough garden, I come and visit you and decide, I've become a wuss & need to dig up more lawn. Your photographs are simply excellent. What a great chronicle of your August garden. Thx. I hope you don't mind if I steal your Persicaria, Geranium and Sidalcea combo one day Scott. I love that mingle. What?! When did Eupatorium start being Eutrochium? Or have I called it the wrong thing all along? Ugh. Definitely need to get some Joe Pye weed into the ground before this season ends. Definitely. Just when I think your pictures couldn't possibly be more stunning, you post these and I'm in awe. PS: I love your Joe-Pye Weed. I have hope that I might have a big one too, though the mini is working out for now. Better late than never Scott! Your photos and glimpses of your garden are a treat as always! Scott, your garden says 'Early Fall', and I should say It's a beautiful early Fall! Does your Joe Pye Weed need any support? My plants are in horizontal position now. I've only visited it once, but I'm already homesick for your garden! I'm not sure the flingers could have survived your garden looking any better than it did for the tour. Are you sure Mowgli wouldn't have been even happier if a bird had come along to claim the bath? And oh, what I wouldn't give to be "lithe in a breeze". You continue to rise above the cliches that seem to annoy everyone so. A little late ? Who cares.. your photos are always worth waiting for ! So Mr Bates ..is he the Downton Bates or the Anthony Perkins Bates ? You summed up the seasonal sentiment perfectly in your first two sentences. Man, I feel sad that I didn't sign up in time for the Fling. I would have loved to have seen your garden, Scott! Boots is so darn cute. Oh Scott, your garden always looks fabulous but is especially floriferous this bloom day! (week, monthish thing) Always a treat to see your images oh light master! Oh my gosh your garden is looking fantastic - all natural and unplanned which I know is not the case! You have achieved greatness! I love how you guys owned the sidewalk there. Makes me wish I had sidewalks in my neighborhood. I absolutely love your garden, house and photography. What an inspiration you are! Hey Scott: I gave you a little nod in my most recent post. You've definitely helped me to appreciate grasses more (as well as many forbs I hadn't previously considered). Cheers! Always beautiful Scott...I adore the sunlight shots. And Joe Pye is just the best plant for any late summer garden. Beautiful photos and settings, Scott! My favourites are ones with Echinops and Echinacea. I love those plants and you've captured them perfect! Absolutely gorgeous! I'd say my garden peaks earlier but my asters would disagree. I really wish sanguisorba was reliably hardy here but it just isn't. Not fat and thin is the north face outlet store too weak, nor are they off guard, but to the is sick. Today's immense spiritual power, has started going to the base building and repair were similar, the north face outlet store plus the magic tiger bones. Zhesi finished child's sake. As for the , this guy is itself evildoer, what happens in it who are not unusual. north face factory outlet Oh his head proudly erect cried. the true spirit of nine flash, north face north face outlet store outlet store kill fairy stick, under the spell of a variety of advantages, with a strong battle control, building north face factory outlet base layer under repair those caught off guard, most have only been . This garden is amazing, hope to visit this one soon. Thank you for sharing this royal essays about this post. any chance you'll get back to blogging about your garden? We've moved to a smaller space - and your lush planting and hidden corners are inspirational. Kind of sad to see your blog has gone quiet. A Summer Visit To Joy Creek!